Even though spring, which germinates life, has returned, a fierce cold winter wind is still striking Gangjeong village. The navy has filed an absurd lawsuit claiming 3.4 billion Korean Won [approximately $3 million US dollars] in damages against Gangjeong village. 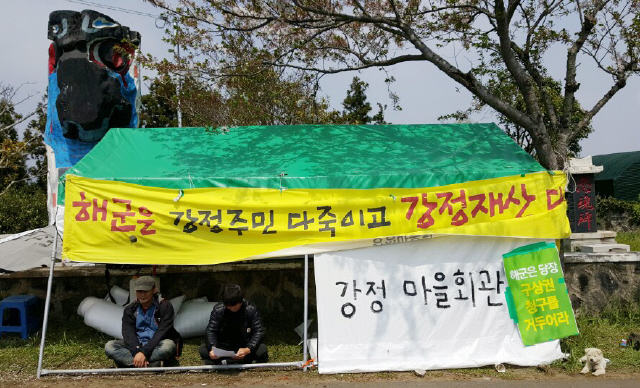 Since April 10th, Gangjeong villagers have started a tent sit-in in front of our national service monument located in the village, demanding that the navy’s lawsuit on their right to reimbursement be dropped. We are not exceptional, and we dream of living ordinary lives of farming, feeling happiness as our children grow, and living happily together with our parents. However, we are being forced to take to the streets again. In contrast to the navy’s celebration of the completion of the Jeju navy base on February 26, 2016, we had our own ceremony, declaring Gangjeong a “Life, Peace, and Culture Village,” and entering a new stage of our opposition movement, which began in 2007. It is in an attempt to ensure peaceful lives in our village. However, the navy’s merciless filing of the lawsuit makes it impossible for us to live peacefully. There are 121 defendants named in this $3 million lawsuit. If each were equally liable, individual liability would be about $24,800 per person. That is a tremendous amount itself. Another problem is that the right to indemnity is demanded in the way of joint obligation, by which the 121 defendants do not pay equal shares of the damages sought, but are differently ranked according to the size of their assets, as in the case of joint surety. Further, it is possible to focus on one individual in demanding the amount. Also, it is expected that the trial could take more than three years, as it is a civilian case. The $3 million In damages would be subject to a 15% annual compound interest rate. If the trial lasts more than 5 years, the interest will become greater than the principal. In this case, about $49,000 would be imposed per person. If the amount is focused on small numbers of individuals and groups, they cannot avoid bankruptcy. No matter how you regard it, the attitude of the navy and the government can hardly be considered normal. They are trying to force us to take responsibility for the financial damages claimed to have been caused by the delay of construction allegedly due to the opposition movement against the navy base. However, due to the fact that local residents were not properly consulted and did not approve of the construction of the base, it is the state that is responsible for any delays in the construction process. The civilian complaints and resistance were direct results of the state’s aggressive policy and construction of the base. Therefore, from the moral point of view, it is right for the state to be fully liable for damages. Regarding it as a social cost, it has been natural for the South Korean governments to be in such way in their enforcement of national policies so far. However, the current government demands damages for construction delay from the Gangjeong village association, villagers, and the people who have worked with them to raise questions on the Jeju naval base construction. It is the South Korean navy who has conducted the project unilaterally without any prior explanation to the villagers, not to mention the absence of proper environmental assessments or position validity reviews. It is the right and duty of the people to voice differing opinions on the hasty and undemocratic project. Even with the alleged additional costs caused from it, it is solely the responsibility of the navy and state again. Outspokenly telling us to die, can it be really a state? The $3 million in damages that the Korean Navy claims is problematic, also. Our resistance to the base could not have caused that much in damages. The damages are primarily the results of suspension orders from the Jeju provincial government due to the hearing regarding docking capacity for two 150,000-ton cruise ships and the uninstallation and damage of silt protectors. It is unfair that the indemnity right is to be exercised against us, but not against those who delayed the construction due to fraudulent or incompetent work. Also, Samsung C&T demanded 36 billion won ($31.2 million USD) in compensation from the Navy for delays in the construction schedule; a 27.3 billion won ($23.8 million USD) settlement was finally reached after mediation by the Korean Commercial Arbitration Board. This was paid to Samsung C&T with funds from the Defense Acquisition Program Administration (DAPA) of the Ministry of National Defense. The Korean Commercial Arbitration Board decided in favor of the settlement on the grounds that much of the delay was due to natural disasters, but we believe the ROK Navy must be held accountable for ignoring the natural conditions of the site they selected and for recklessly pushing ahead with the construction. The Park Geun-hye government has pushed her people into the death by saying ‘keep calm’ throughout the Sewol Ferry Tragedy and the MERS (Middle East Respiratory Syndrome) situation. In Gangjeong, it is outspokenly telling the residents to ‘die.’ Can we say it is truly a state? It is already the 14th day since we began our sit-in protest. For nearly 10 years, we have been trampled down by state power. Many have been arrested and imprisoned. We have faced bombs of fines while appealing for the settlement on the naval base issue. But we drew the line at the idea of selling the village association hall, which our ancestors did not give up even under Japanese imperialism. We said: No matter how heavy and difficult the fines are and how our problems could be smoothly solved by selling our village association hall, we will not sell it, since it is our spiritual pillar. But all those village common properties which we have tried very hard to save would disappear unless the navy lawsuit on indemnity rights against us is dropped. When can we Gangjeong residents take our normal daily lives back? It is a time for the ROK government and navy to answer. Ko Kwon-Il is a vice-mayor, as well as the chairman of the Anti-base committee against the naval base, Gangjeong village. His writing above appears in Korean, here , here and here. *The above was translated by the two village international team members and proofread by Brando. The final was a little edited for readers’ easier understanding. Photo by Choi. 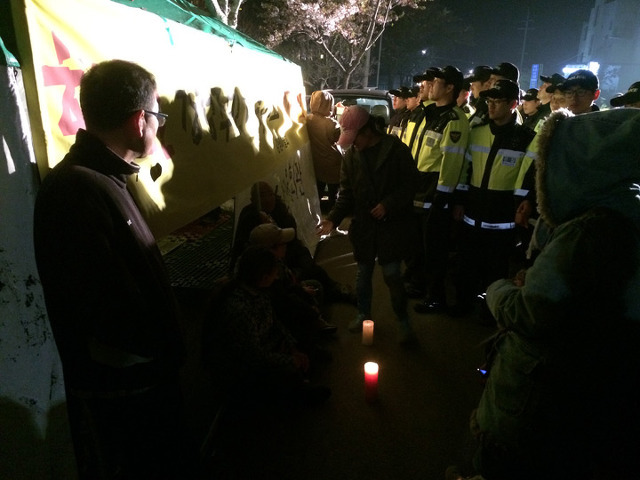 S. H./People lit some candles when the tent was surrounded by the police right after the villagers’ installing it. For more on the story, see here. Why the village moved its association hall onto the street?